Several recommendations concerning Boulder Valley’s school board elections have been published so far. One endorsement, enunciated by the Boulder Valley Education Association, raises questions. The association represents all certified employees of the school district, including the teachers and most of the administrators. They endorsed Kitty Sargent, Dean Vlachos and Tina Marquardt as future school board members. Marquardt has no competitor, while Sargent is challenged by Alexandra Eddy in District F and Vlachos competes with Donna Miers and Raj Rawat in District E.
David Stewart, teacher and volunteer for BVEA in the campaign, explained that all candidates were assessed by a questionnaire and a personal interview with an independent teacher. The association wanted the process to be as unbiased as possible and used the Colorado Education Association’s guidelines to contrast the candidates. “They were all asked the same questions,” stated Stewart. Hiring a new superintendent is one of the more prominent tasks for the new school board – and apparently the most delicate one. Both Rawat, also candidate for District E, and Vlachos admitted that there had been lots of anger and frustration about a lack of transparency in the school board regarding former superintendents. “For two terms now, the Boulder Valley school district superintendents have left without enough transparency about why,” Rawat described. Especially the dismissal of former superintendent Bruce Messinger last spring threw the (school) district into turmoil. “There are some legalities, but to answer your questions, I have no idea, I don’t know the exact specifics,” commented Vlachos his knowledge about the dismissal. Neither do the other candidates. “During the campaign, I asked ‘What happened, what happened, what happened’,” said Alexandra Eddy, candidate for District F. She did not get an answer, why the board hid details about Bruce Messinger’s trial. But she trusts the board’s decision. Vlachos supposed, it must be some personal related matter. But in his opinion, it is up to the people who are involved what they want to reveal and what not. But Rawat questions BVEA’s current endorsement and the association’s motives for their decision. “First, I couldn’t believe, I thought this was a hoax. That somebody wrote a note in their name, to make them look bad,” said Rawat about the, as he called it, “fearmongering style” of the recommendation. He highly respects teachers as well as the association and could not believe they assume “things like, there will not be transparency, if somebody who was not selected by the teacher’s union gets in, that people are running for the board, because it is their pet project.” Rawat replied to BVEA and asked for clarification. Rawat also forwarded the email and his reply to several persons, among them the six other candidates. 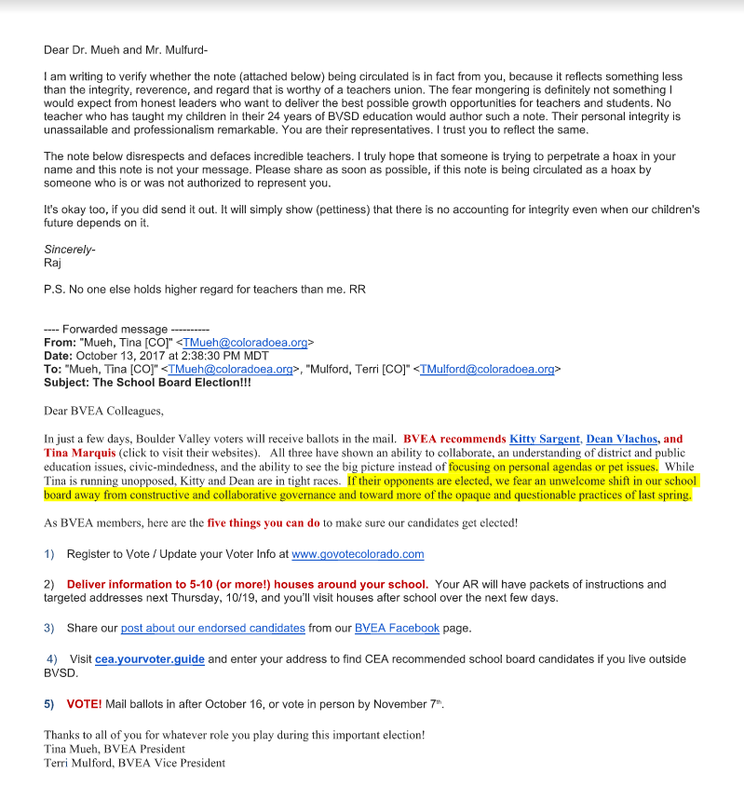 “Yes, I had seen it before,” said Vlachos, environmental engineer and spouse of a teacher, about the E-Mail from the association. Sargent, a former teacher, said she was probably chosen because she has the experience and her participation in the school board will benefit teachers and parents. 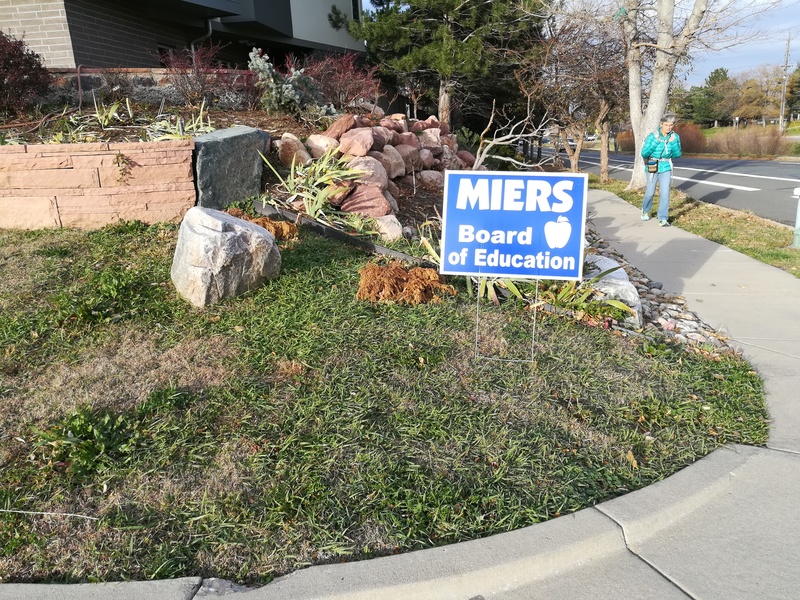 Sargent’s challenger Eddy, herself educated in the BVSD and the youngest candidate in the race, regretted that she didn’t get BVEA’s support. The association has over 1,400 members and, as Stewart stated, a loud voice in the community. But, as Stewart further explained, the association will not take any actions in response to Rawat’s request for clarification. Rawat suggested to reconsider their endorsement, said Stewart. As far as he is informed, the association had never reconsidered their decisions before and will not do it this time. How to communicate climate change?